Navigating large workspaces with mobile devices often require users to access information that spatially lies beyond its‟ viewport. To browse information on such workspaces, two prominent spatially-aware navigation techniques, peephole, and direct off-screen pointing, have been proposed as alternatives to the standard on-screen flick and pinch gestures. Previous studies have shown that both techniques can outperform on-screen gestures in various user tasks, but no prior study has compared the three techniques in a map-based analytic task. 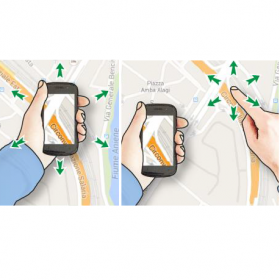 In this paper, we examine these two spatially-aware techniques and compare their efficiency to on-screen gestures in a map navigation and exploration scenario. Our study demonstrates that peephole and direct off-screen pointing allows for 30% faster navigation times between workspace locations and that on-screen flick and pinch is superior for accurate retrieval of workspace content. Khalad Hasan, David Ahlström, and Pourang Irani. 2015. Comparing Direct Off-Screen Pointing, Peephole, and Flick&Pinch Interaction for Map Navigation. In Proceedings of the ACM Symposium on Spatial User Interaction (SUI 2015). Los Angeles, USA. ACM. 99-102.